Boardmember.com in its October, 11, 2012 issue carries an op-ed item by Nathan Bennett and Stephen Miles titled, “Is your Board About to Pick the Wrong CEO.” Although targeted to for-profit boards, all of the five items listed can be applied to nonprofit boards. Following are my applications to nonprofit boards. 1. Is There Interpersonal Conflict on the nonprofit board? If there is a high level of interpersonal board discord, the board is setting up the new executive director for failure, no matter how strong the e executive’s background or talents. The same can be said if the staff is “at war” with the board. No matter who the board chooses, the new person is tainted as the board’s change agent, not a collegial leader. 2. Are There Irreconcilable Differences Regards the Mission, Vision and Values of the Nonprofit Organization? Any ambivalence between board members, or board and a significant group of staff members, on these important issues will lead to discords that might motivate the staff to seek union protection. 3. Does the current nonprofit CEO have too much say? 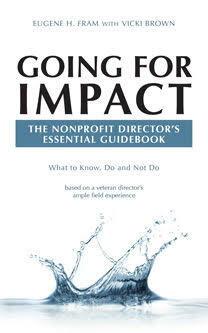 Traditionally nonprofits do not involve the outgoing or terminated executive in the search process. However, this division, on occasion, can be carried too far because the outgoing person has some knowledge that can be helpful to the incoming executive. This issue provides the board with a fine line to walk. Which path a board takes is highly situational. 4. Is There Insufficient Diversity? Nonprofit boards generally need to seek a wide range of candidates in terms of internal vs. external, gender, ethnicity, and age diversity. As the old Chinese view states, “A wise man (or woman) learns by his own experience, the wiser man (or woman) learns by the experience of others.” Here is an opportunity to learn from others.